This is Part 2 of my mini-series on selecting an oscilloscope. Rather than a completely thorough guide, it’s more a “collection of notes” based on my own research. But I hope you find it useful, and it might cover a few areas you hadn’t considered. Last week I mentioned the differences between PC-based and stand-alone oscilloscopes and discussed the physical probe’s characteristics. This week I’ll be discussing the “core” specifications: analog bandwidth, sample rate, and analog-to-digital converter (ADC) resolution. Many useful articles online discuss the analog oscilloscope bandwidth, so I won’t dedicate too much time to it. 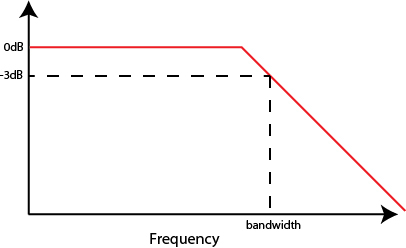 Briefly, the analog bandwidth is typically measured as the “half-power” or -3 dB point, as shown in Figure 1. Half the power means 1/√2 of the voltage. Assume you put a 10-MHz, 1-V sine wave into your 100-MHz bandwidth oscilloscope. You expect to see a 1-V sine wave on the oscilloscope. As you increase the frequency of the sine wave, you would instead expect to see around 0.707 V when you pass a 100-MHz sine wave. If you want to see this in action, watch my video in which I sweep the input frequency to an oscilloscope through the -3 dB point. Figure 1: The bandwidth refers to the “half-power” or -3 dB point. If we drive a sine wave of constant amplitude and increasing frequency into the probe, the -3 dB point would be when the amplitude measured in the scope is 0.707 times the initial amplitude. Unfortunately, you are likely to be measuring square waves (e.g., in digital systems) and not sine waves. Square waves contain high-frequency components well beyond the fundamental frequency of the wave. For this reason the “rule of thumb” is to select an oscilloscope with five times the analog bandwidth of the highest–frequency digital signal you would be measuring. Thus, a 66-MHz clock would require a 330-MHz bandwidth oscilloscope. If you are interested in more details about bandwidth selection, I encourage you to see one of the many excellent guides. Adafruit has a blog post “Why Oscilloscope Bandwidth Matters” that offers more information, along with links to guides from Agilent Technologies and Tektronix. If you want to play around yourself, I’ve got a Python script that applies analog filtering to a square wave and plots the results, available here. Figure 2 shows an example of a 50-MHz square wave with 50-MHz, 100-MHz, 250-MHz, and 500-MHz analog bandwidth. 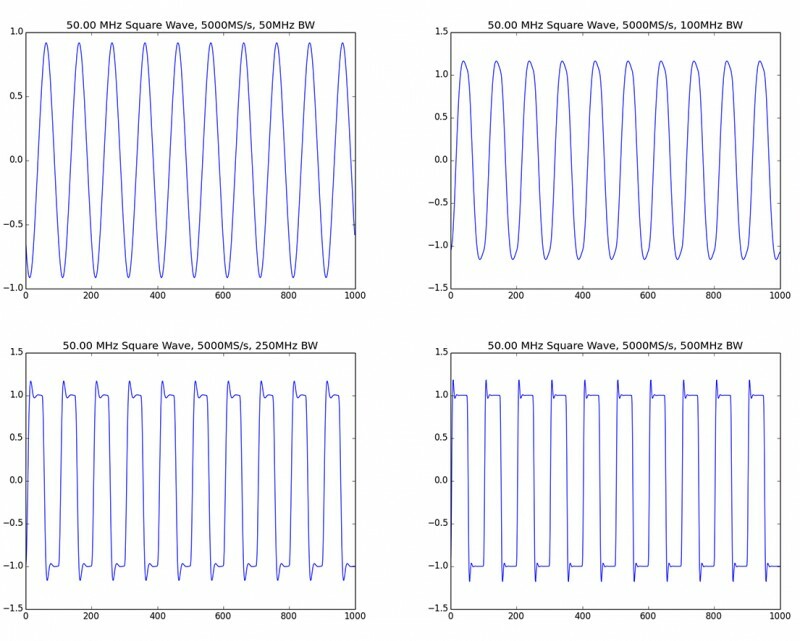 Figure 2: This shows sampling a 50-MHz square wave with 50, 100, 250, and 500 MHz of analog bandwidth. Beyond the analog bandwidth, oscilloscopes also prominently advertise the sample rate. Typically, this is in MS/s (megasamples per second) or GS/s (gigasamples per second). The advertised rate is nearly always the maximum if using a single channel. If you are using both channels on a two-channel oscilloscope that advertises 1 GS/s, typically the maximum rate is actually 500 MS/s for both channels. So what rate do you need? If you are familiar with the Nyquist criterion, you might simply think you should have a sample rate two times the analog bandwidth. Unfortunately, we tend to work in the time domain (e.g., looking at the oscilloscope screen) and not the frequency domain. So you can’t simply apply that idea. Instead, it’s useful to have a considerably higher sample rate compared to analog bandwidth, say, a five times higher sample rate. To illustrate why, see Figure 3. It shows a 25.3-MHz square wave, which I’ve sampled with an oscilloscope with 50-MHz analog bandwidth. As you would expect, the signal rounds off considerably. However, if I only sample it at 100 MS/s, at first sight the signal is almost unrecognizable! Compare that with the 500 MS/s sample rate, which more clearly looks like a square wave (but rounded off due to analog bandwidth limitation). Again, these figures both come from my Python script, so they are based purely on “theoretical” limits of sample rate. You can play around with sample rate and bandwidth to get an idea of how a signal might look. Figure 3: This shows sampling a 25.3-MHz square wave at 100 MS/s results in a signal that looks considerably different than you might expect! Sampling at 500 MS/s results in a much more “proper” looking wave. Certain oscilloscopes have an equivalent time sampling (ETS) mode, which advertises an insanely fast sample rate. For example, the PicoScope 6000 series, which has a 5 GS/s sample rate, can use ETS mode and achieve 200 GS/s on a single channel, or 50 GS/s on all channels. The caveat is that this high sample rate is achieved by doing careful phase shifts of the A/D sampling clock to sample “in between” the regular intervals. This requires your input waveform be periodic and very stable, since the waveform will actually be “built up” over a longer time interval. So what does this mean to you? Luckily, many actual waveforms are periodic, and you might find ETS mode very useful. For example, if you want to measure the phase shift in two clocks through a field-programmable gate array (FPGA), you can do this with ETS. At 50 GS/s, you would have 20 ps resolution on the measurement! In fact, that resolution is so high you could measure the phase difference due to a few centimeters difference in PCB trace. To demonstrate this, I can show you a few videos. To start with, the simple video below shows moving the probes around while looking at the phase difference. A more practical demonstration, available in the following video, measures the phase shift of two paths routed through an FPGA. Finally, if you just want to see a sine wave using ETS you can check out the bandwdith demonstration I referred to earlier in the this article. The video (see below) includes a portion using ETS mode. A less prominently advertised feature of certain oscilloscopes is the ADC bit resolution in the front end. Briefly, the ADC resolution tells you how the analog waveform will get mapped to the digital domain. If you have an 8-bit ADC, this means you have 28 = 256 possible numbers the digital waveform can represent. Say you have a ±5 V range on the oscilloscope—a total span of 10 V. This means the ADC can resolve 10 V / 256 = 39.06 mV difference on the input voltage. This should tell you one fact about digital oscilloscopes: You should always use the smallest possible range to get the finest granularity. That same 8-bit ADC on a ±1 V range would resolve 7.813 mV. However, what often happens is your signal contains multiple components—say, spiking to 7 V during a load switch, and then settling to 0.5 V. This precludes you from using the smaller range on the input, since you want to capture the amplitude of that 7-V spike. If, however, you had a 12-bit ADC, that 10 V span (+5 V to -5 V) would be split into 212 = 4,096 numbers, meaning the resolution is now 2.551 mV. If you had a 16-bit ADC, that 10-V range would give you 216 = 65,536 numbers, meaning you could resolve down to 0.1526 mV. Most of the time, you have to choose between a faster ADC with lower (typically 8-bit) resolution or a slower ADC with higher resolution. The only exception to this I’m aware of is the Pico Technology FlexRes 5000 series devices, which allow you to dynamically switch between 8/12/14/15/16 bits with varying changes to the number of channels and sample rate. While the typical ADC resolution seems to be 8 bits for most scopes, there are higher-resolution models too. As mentioned, these devices are permanently in high-resolution mode, so you have to decide at purchasing time if you want a very high sample rate, or a very high resolution. For example, Cleverscope has always advertised higher resolutions, and their devices are available in 10, 12, or 14 bits. Cleverscope seems to sell the “digitizer” board separately, giving you some flexibility in upgrading to a higher-resolution ADC. TiePie engineering has devices available from 8–14 bits with various sample rate options. Besides the FlexRes device I mentioned, Pico Technology offers some fixed resolution devices in higher 14-bit resolution. Some of the larger manufacturers also have higher-resolution devices, for example Teledyne LeCroy has its High Resolution Oscilloscope (HRO), which is a fixed 12-bit device. Note that many devices will advertise either an “effective” or “software enhanced” bit resolution higher than the actual ADC resolution. Be careful with this: software enhancement is done via filtering, and you need to be aware of the possible resulting changes to your measurement bandwidth. Two resources with more details on this mode include the ECN magazine article “How To Get More than 8 Bits from Your 8-bit Scope” and the Teledyne LeCroy application note “Enhanced Resolution.” Remember that a 12-bit, 100-MHz bandwidth oscilloscope is not the same as an 8-bit, 100-MHz bandwidth oscilloscope with resolution enhancement! Using the oscilloscope’s fast Fourier transform (FFT) mode (normally advertised as the spectrum analyzer mode), we can see the difference a higher-resolution ADC makes. When looking at a waveform on the screen, you may think that you don’t care at all about 14-bit accuracy or something similar. However, if you plan to do measurements such as total harmonic distortion (THD), or otherwise need accurate information about frequency components, having high resolution may be extremely important to achieve a reasonable dynamic range. As a theoretical example I’m using my script mentioned earlier, which will digitize a perfect sine wave and then display the frequency spectrum. The number of bits in the ADC (e.g., quantization) is adjustable, so the harmonic component is solely due to quantization error. This is shown in Figure 4. If you want to see a version of this using a real instrument, I conduct a similar demonstration in this video. Certain applications may find the higher bit resolution a necessity. For example, if you are working in high-fidelity audio applications, you won’t be too worried about an extremely high sample rate, but you will need the high resolution. This week I’ve taken a look at some of the core specifications. I hope the questions to ask when purchasing an oscilloscope are becoming clearer! Next week, I’ll be looking at the software running the oscilloscope, and details such as remote control, FFT features, digital decoding, and buffer types. The fourth and final week will delve into a few remaining features such as external trigger and clock synchronization and will summarize all the material I’ve covered in this series. Recently, I was in the market for a new oscilloscope. There’s a good selection of devices for sale, but which should you choose? It’s clear from the ads that the “scope bandwidth” and “sample rate” are two important parameters. But are there other things hidden in the specification sheet you should take a look at? I’ve compiled notes from my own oscilloscope-selection experience and wanted to share them with you. I’ll be pulling in specifications and examples from a few different oscilloscopes. Personally, I ended up selecting a PicoScope device, so I will be featuring it more prominently in my comparisons. But that’s simply because I don’t have a lab full of oscilloscopes to photograph! I don’t work for Pico Technology or have any affiliation with it, and will be attempting to pull in other manufacturers for this online series to provide some balance. This “mini-series” will consist of four posts over four weeks. I won’t be discussing bandwidth and sample rate until next week. In this first post, I’ll cover some physical characteristics: stand-alone vs PC-based probe types and digital inputs. Next week I’ll discuss the “core” specifications, in particular the bandwidth, sample rate, and analog-to-digital converter resolution. The third week will look at the software running the oscilloscope, and details such as remote control, fast Fourier transform (FFT) features, digital decoding, and buffer types. The final week will consider a few remaining features such as the external trigger and clock synchronization, and will summarize all the material I’ve covered. Topic 1: Do You Want a PC-Based or Stand-Alone Instrument? There are two fundamentally different types of instruments, and you’ll have to decide for yourself which you prefer. Many people like a stand-alone instrument, which you can place on your bench and probe your circuits to your heart’s content. You don’t need to have your computer nearby, and you have something solely dedicated to probing. Photo 1: PC-based oscilloscopes make mounting easier on a crowded bench. This PicoScope 6000 unit is velcroed to my desk. You can see the computer monitor to the upper left. The other option is a PC-based instrument, which today generally means it plugs in via USB. I’ve always preferred this type for a few reasons. The first is the minimal desk space needed. I can place an oscilloscope vertically and lose little space (see Photo 1). The second is I find it easier to interact with a standard keyboard and mouse, especially if you’re using more advanced features. In addition, you can easily save screenshots or data from the scope without having to transfer them using a USB key or something similar. There are a few downsides to USB-based instruments. The most common complaint is probably the lack of knobs, although that’s fixable. In Photo 2, you can see a USB-based “knob board” I built, which pretends to be a USB key. Each turn of the knob sends a keystroke and, as long as your PC-based oscilloscope software lets you set custom keyboard shortcuts, can trigger features such as changing the input range or timebase. Most of the time, I still just use the regular PC interface, as I find it easier than knobs. If you’re interested in the design, you can find it on my blog Electronics & More. 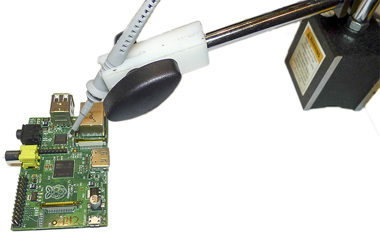 Photo 2: A simple USB-based knob board uses mechanical encoders to control the USB scope via a physical panel. Having a PC-based oscilloscope also means you can have a massive screen. A high-end oscilloscope will advertise a “large 12.1″ screen,” but you can purchase a 22″ screen for your computer for $200 or less. If your PC-based oscilloscope software supports multiple “viewports,” you can more easily set up complex displays such as that in Figure 1. Again this comes down to personal preference—personally, I like having the oscilloscope display as a window on my computer. You may wish to have a dedicated display separate from your other work, in which case consider a stand-alone device! 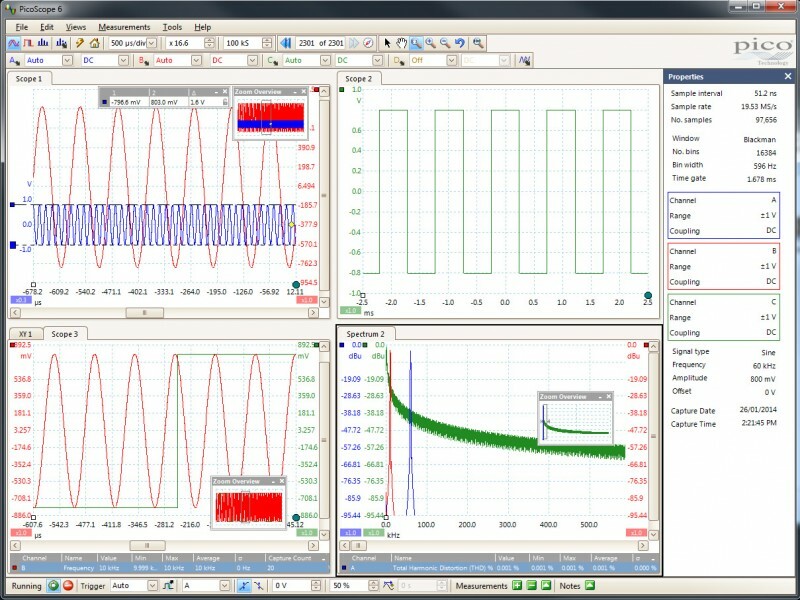 Figure 1: PC-based oscilloscopes make it easier for setting up windows in specific positions, due to a combination of much larger screen space and standard mouse/keyboard interaction. Topic 2: Where’s the Ground? One common complaint with the PC-based oscilloscope is that the probe ground connects to USB ground. Thus, you need to ensure there isn’t a voltage difference between the ground of your device under test and the computer. This is, in fact, a general limitation of most oscilloscopes, be they stand-alone or PC-based. If you check with an ohmmeter, you’ll generally find that the ”probe ground” in fact connects to system Earth on stand-alone oscilloscopes. Or at least it did on the different Agilent units I tested. Thus the complaint is somewhat unfairly leveled at PC-based devices. You can get oscilloscopes that have either “differential” or “isolated” inputs, which are designed to eliminate the problem of grounds shorting out between different inputs. They may also give you more measurement flexibility. For example, if you are trying to measure the voltage across a “high-side shunt resistor,” you can do this measurement differentially. The TiePie engineering HS4 DIFF is one example of a device with this capability. Of course, you can purchase differential probes for any oscilloscope, which accomplish the same goal! Most manufactures make these differential probes (Agilent, Tektronix, Pico Technology, Rigol, etc.). Almost every scope will have either DC-coupled or AC-coupled inputs. You’ll likely want to compare the minimum/maximum voltage ranges the scope has. Don’t be too distracted by either the upper or lower limits unless you have very specific requirements. At the upper end, remember you will mostly be using the 10:1 probe, which means an oscilloscope with ±20 V input range becomes ±200 V with the 10:1 probe. At the lower end, the noise is going to kill you. If your oscilloscope has a 1 mV/div range, for example, you’ll have to be extremely careful with noise. To probe very small signals, you’ll probably end up needing an active probe with amplification right at the measurement point. This can be something you build yourself, using a differential amplifier chip, for example, if you are attempting to measure current across a shunt. Besides the actual measurement range, you’ll be interested in the “offset” range too. With the DC-input, most oscilloscopes can subtract a fixed voltage from the input. Thus you can measure a 1.2-V input on a 1-V maximum input range, as the oscilloscope is able to first subtract say 1 V from the signal. This is handy if you have a smaller signal riding on top of some fixed voltage. Another input type you will encounter is the 50-Ω input. Normally, this means the oscilloscope can switch between AC, DC, and DC 50 input types. The DC 50 means the input is “terminated” with a 50-Ω impedance. This feature is typically found on oscilloscopes with higher analog bandwidth. For example, this allows you to measure a clock signal that is output on a SMA connector expecting a 50-Ω termination. In addition, the 50-Ω input allows you to simplify connection of other lab equipment to your oscilloscope. Want to use a low noise amplifier (LNA) to measure a very small signal? Not a problem, since you can properly terminate the output of that LNA. If you end up needing DC 50 termination, you can buy “feed-through” terminators for about $15, which operate at up to 1-GHz bandwidth. You simply add those to the front of your oscilloscope to get 50-Ω terminated inputs. Any given manufacturer will often have a range of inputs for different bandwidths and models. For example, the PicoScope 5000-series, which has up to 200-MHz bandwidth, has DC/AC high-impedance inputs. The 6000-series has DC/AC/DC 50 inputs for 500-MHz bandwidth and below. The 6000 series in 1,000 MHz bandwidth only has 50-Ω input impedance. Other manufacturers seem to follow a similar formula: the highest bandwidth device is 50-Ω input only, medium-bandwidth devices are DC/AC/DC 50, and lower-bandwidth devices will be DC/AC. In day-to-day use, nothing will impact you more than the quality of your oscilloscope probe. This is your hands-on interaction with the oscilloscope. Photo 3: A smaller spring-loaded probe tip is on the left, and a standard oscilloscope probe is on the right. Both probes have removable tips, so if you damage the probe it’s easy to fix them. Not all probes have removable tips, however, meaning if the tip is damaged you may have to throw out the probe. Most “standard” oscilloscope probes are of the type pictured to the right in Photo 3. They are normally switchable from 1:1 to 10:1 attenuation, where the 10:1 mode results in a 1/10 scaling of input voltage. It’s important to note that almost every oscilloscope probe has very limited bandwidth in 1:1 mode—often under 10 MHz. Whereas in 10:1 mode it might be 300 MHz! In addition, the 10:1 mode will load the circuit considerably less. Higher bandwidth probes will often only come in 10:1 mode. I assume the physical switch is too much hassle at higher frequencies! A first thing to check out is if the tip is removable. If you damage the tip, it can be useful to simply replace the tip rather than the entire probe. 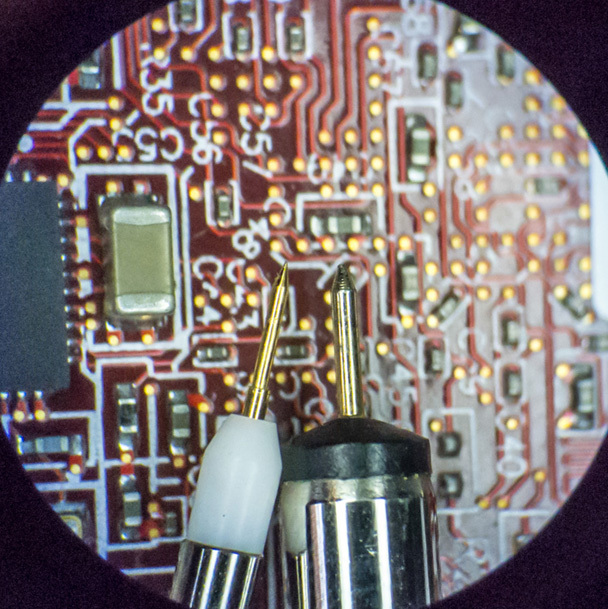 If you’re probing a PCB, it can be easy to catch a tip in a via, for example. Alternatively, certain probes might come with an adapter, which is designed for use in probing the PCB, rather than just the tip of the regular oscilloscope probe. The older Agilent 1160A probes come with such a tip. One particular type of probe I really like has the spring-loaded tip shown to the left in Photo 3. This is a much smaller tip than “standard,” and the spring-loaded tip makes it much easier to get a good connection with solder joints. You can apply some pressure to break through the oxide layer, and the spring-loaded aspect keeps the tip right on the joint. In addition, you can even do things such as probe through the solder mask on a via. There are even plastic guard add-ons, which fit standard surface mount device (SMD) sizes (e.g., 1.27 mm, 1 mm, 0.8 mm, 0.5 mm) to probe TQFP/SOIC/TSSOP packages. The particular probe I’m photographing comes with the PicoScope 6000 series, which is sold separately as part number TA150 (350-MHz bandwidth) or TA133 (500-MHz bandwidth). However, I’ve noticed that Agilent seems to also sell a probe that looks the same—under part number N287xA—right down to accessories. Similarly, Teledyne LeCroy also seems to sell this probe under the PP007 part number, and Rohde & Schwarz sells it under the RTM-ZP10 part number, also with the same accessories. Thus I suspect there is some upstream manufacturer! Depending on your supplier and options, prices range from $200-$400 for the probe if you want to pick it up separately. Photo 4: The ground spring accessory can be used in a number of ways. If you’re lucky, you can insert it into GND vias on your PCB. If required, you can also solder a small section of wire to the spring. Pomona Electronics sells a similar probe, part numbers 6491 through 6501 (the exact partnumber depending on bandwidth). The 150-MHz version (6493) is available for under $60 from Digi-Key, Mouser, and Newark element14, for example. This probe differs from the previous group of spring-loaded ones, but if you don’t need the higher bandwidth it may be a more reasonable purchase. If you are dealing with a high-bandwidth probe, you may need to be concerned about the flatness of the frequency response. A probe may be sold with a 1G-Hz bandwidth, for example, which simply means the -3-dB point is at 1GHz. However, shoddy manufacturing may mean not having a very flat frequency response before that point, or not rolling off evenly after the -3-dB point. When dealing with high bandwidth probes, the grounding will become a serious issue. The classic “alligator clip” probably won’t cut it anymore! The simplest accessory your probe is likely to come with is the spring adapter shown in Photo 4. There may be more advanced accessories available for grounding, too; check documentation for the probe itself. You can see an example of differences in grounding as part of my “probe review” video. Don’t be afraid to build your own accessories for the probe. Photo 5 shows a probe holder I built for a $15 adjustable arm. Details of the construction are here. Photo 5: Here’s a simple 3-D probe holder you can build for $20 or less. The final item to consider is if you want digital inputs along with analog. This is, again, somewhat of a personal choice: You may wish to have a separate stand-alone digital analyzer, or you may wish to have it built into your oscilloscope. I personally chose to have a stand-alone digital logic analyzer, which is a PC-based instrument. Digital logic analyzers are available at a fairly low cost from a variety of manufacturers (e.g., Saleae and Intronix). 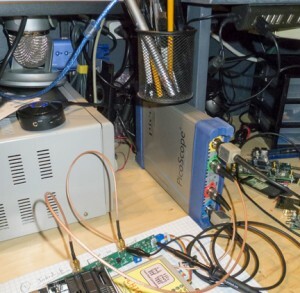 In my experience, the cost of purchasing a separate PC-based logic analyzer was considerably lower than the “incremental cost” of selecting an oscilloscope with logic analyzer capabilities compared to one without. When evaluating this yourself, be sure to look at features such as number of channels, maximum sample rate, buffer size, and what protocols can be decoded by the logic analyzer. While integrated-device manufacturers claim you should buy a scope/analyzer in one unit to get perfect synchronization between digital and analog, remember many of these devices can output a trigger signal. So if your oscilloscope can output a trigger signal when it starts the analog capture, you can use this to capture the corresponding data on the digital logic analyzer (or vice versa). This first week I covered physical details of the oscilloscope itself you might want to consider. Next week, I’ll look at the more ‘”core” specifications such as bandwidth, sample rate, and sample resolution.